A friend emailed me the other day and was asking for some tips on making daily transitions easier for her child. I sent her an email with these ideas and thought they might be useful to some of you. In all honesty, I need to remind myself of all of these A LOT. It is hard to remember them all when you have a lot to do during the course of the day and more than one kid to think about! That being said, when you have a child throwing a huge tantrum because you didn't remember them... it reminds you that they are pretty important! There are many more things I could add, but today I am just sharing a few tips for helping make daily transitions easier for your kids... which ultimately makes your day a bit easier too. I would love to hear what works for you too... so make sure to share your fabulous thoughts in the comments! 1. Minimize the number of transitions your child has during the course of a day. Don't over-schedule your child... this can be hard with trying to fit in appointments, school, errands, etc. Make sure your child has plenty of time to play, hang out at home/outside, and just be a kid... no playdates or structured anything. Schedule down time on your calendar! 2. Build choice into each portion of your child's day. Sometimes you have to be creative with this. There is always a choice to be had. Your child can choose to say no... but if you give your child two choices and help him feel like he is getting to make the decision, he may choose one of your ideas instead of completely staging a revolt. Make sure you are OK with both choices before you offer them. As adults, most of us get to pick how we structure specific parts of our day... or at least the order in which we do things. Let your child lead the way as often as you can. Communicate verbally and visually and make sure to check in with your child to make sure she hasn't missed any messages you've given. Often if my son is throwing a tantrum about leaving the park it is because he didn't hear the two other times when I said we were leaving in 5 minutes. I try and make sure I make eye contact and get a verbal response that he heard/understood me. 4. Ask and actually listen. As kids get older they get frustrated when mom is always dictating the schedule. Listen and take their needs into consideration. Tantrums are a way they will communicate if they can't communicate in other ways or they feel that you aren't listening to them when they try and use their words. 5. Use routines, schedules, transition objects, and timers to help with transitions. Only use these if they help... you can tell if a timer doesn't work for your kid because it makes them angry, anxious, or more frustrated. Often when my daughter needs to transition to something new (like leaving a fun game to go run errands at the grocery store), she takes a toy train with her as a transition object. 6. Make sure all basic needs have been met. These are often reasons for tantrums during a transition. Is your child tired? (Did you have an extra busy day?) What did he/she eat? When? Has your child slept enough? Is she not feeling good? thirsty? etc. It is much harder to handle doing something you don't want to do if basic needs haven't been taken care of. Anything can cause a tantrum at the end of a long, busy, exhausting day, no matter how old a child (or adult) is. I have had plenty of my share of evening tantrums as a tired pregnant mom! 7. Be aware of transition timing. How often are transitions happening? If your child is having to transition between things too frequently that is definitely something that will cause extra frustration. Think about the transition and decide if it is really necessary right at that moment? If your child is happily playing on the swings, does she need to get off if no one is waiting? Adults often want to help kids have a lot of experiences when often kids want to repeat the same activity or experience again and again and again. They often don't move at the same pace as adults. I think we could learn a lot from kids by slowing down. 8. Look at yourself and your own schedule and assess things a bit. Do you feel like your child is getting enough undivided attention from you? Could you give more? What are some creative ways to focus more on your child during a busy day? If your lives are over scheduled or busy then it may also be that your child has learned that the tantrum is a great way to get to spend more time with you. 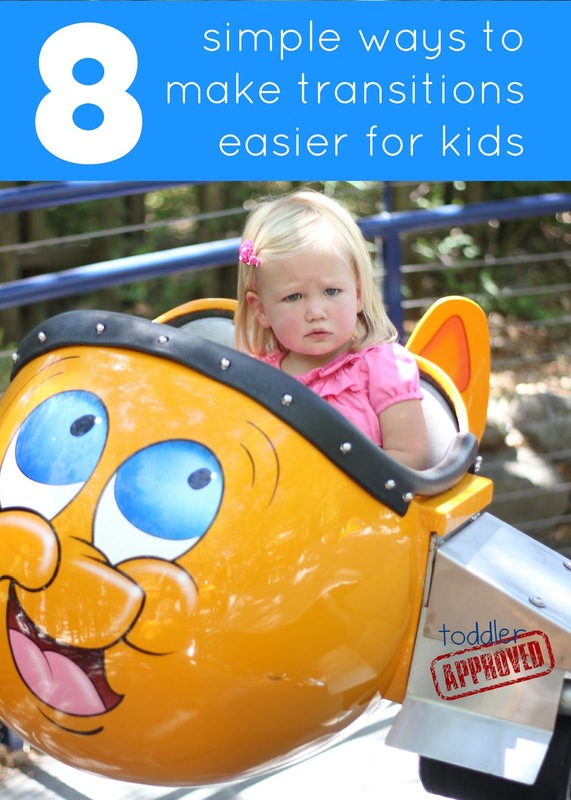 Do your kids have a hard time transitioning between activities? What is the hardest transition for them to make? PS- Did you fill out our Summer Reader survey yet? Go here to do it and enter our special reader giveaway just for participants. The giveaway winner will get three of our favorite Fall picture books! I try to not to schedule too many boring mummy-activities in a row. If we have some errands to do and a park to visit, then I'll try to get to the park in the middle (but not at the expense of convenience - if all your errands are in the same spot then just rush and get them over with!). Otherwise the frustration kicks in. Transitions just bring it all up to the surface - a reminder that we could be choosing to do something fun instead of go somewhere else boring! I also think it's particularly important to remember that children are more fully "in" their bodies than we are. We live in a culture and a time that emphasizes our brains, actually one side of our brains, so we tend to focus on language and so-called educational activities at the expense of body-based awareness. This can make transitions more difficult. Great tips! When you're busy it's easy to forgot how stressful transitions can be on little ones! I love point #7 - I'm forever trying to switch things up for my kids thinking they will get bored, when really they are pretty content (and even happy) doing the same thing over and over. Good points...listening is a great point I have found things go smoother when you take the time to listen. I wish I had this list when our son was younger! When he was 2 or 3, we were able to use "Say Goodbye to the . . ." and that would help him. And when he became familiar with dvd players and the pause function, HE started using "let's push pause" for things, so we jumped on that. It worked for pausing play time to go potty, pausing a game to have dinner, you name it. He's seven, and it is still a helpful tool.